I personally like cranberries but hardly ever cook them except in a pound cake/muffins where I mix them with apples and other Fall spices. 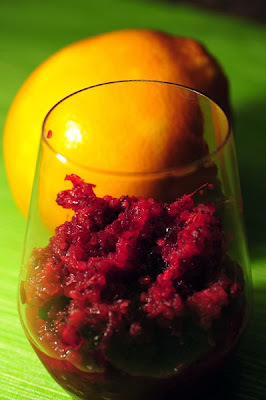 The other recipe I discovered last year through a friend of mine and have been enjoying (alone - no one else except my mom would eat it at home)... is this orange-cranberry relish. I like it because I cut the sugar amount in half and let it "cook" overnight in its juice. I eat it as dessert or with some roasted winter squash and .... chestnuts. I have seen this (or very similar) recipe in cooking magazines this year so maybe some of you just had it with your turkey a few days ago! If not, make it with leftovers/discounted fresh cranberries you can find around you these days. It's really worth it... and a most welcome change from the canned cranberry sauce I have tasted in the past! Bon Appetit! Cut the orange ( with the peel on) into 16 chunks and discard any seeds. Working in batches, combine the orange chunks, cranberries, sugar and ginger in a food processor. Pulse to chop finely and evenly, stopping once or twice with each batch to scrape down the sides of the bowl. 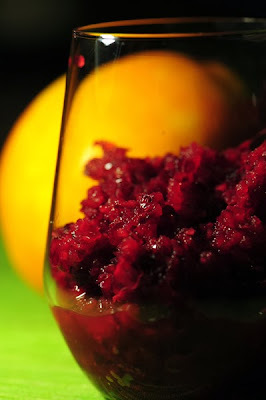 Transfer to a storage container, cover and refrigerate for at least 24 hours to develop the flavors. Bring to room temperature and stir well before serving. Can prepare up to 3 days in advance.